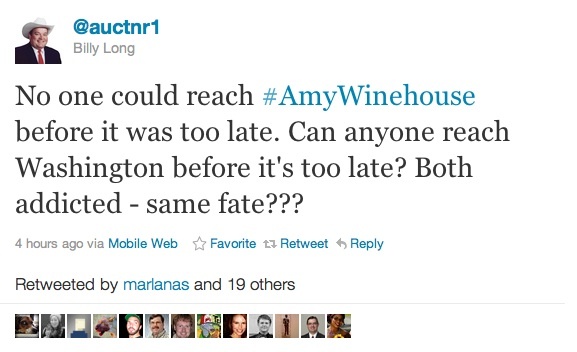 The Congressman for Missouri’s 7th District, Billy Long, took to twitter earlier today to finally make the connection we’ve all been searching for: How is the government’s looming debt crisis like Amy Winehouse’s recent demise? Nailed it. 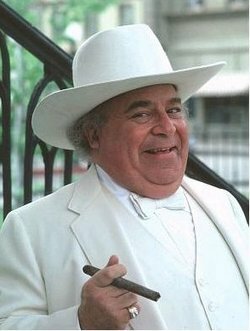 Way to related to the young people, old fat guy in a cowboy hat that makes odd references to a celebrity death on the currently popular social network! Congressman Boss Hog here thought he was mighty clever after he thought this one up! You get it right? Both Winehouse and the government are “addicted” to stuff, and reaching August 2nd without a new debt ceiling deal in place will be like America passed out and died on the floor of our London flat…wait, what? We’d like to think that at least Long managed to pick the least offensive death news from this weekend, but the day is still young and right now Long is probably sitting on the wooden horse he uses as an office chair, rocking back and forth, as he tries to find the best way to tie Norway’s most brutal murder in to the debt crisis. Stop what you’re doing Billy and back away from your computer slowly. Any references to “blowing up the economy” would be unwise at this point, even if you can’t pick out Norway on a map.